The Search for the ‘Ideal’… Melee Weapon. You! Yes you! You have a decision to make! Well… that’s not true…you don’t have to. It’s just a bit of fun really. I didn’t mean to put you under that much pressure. I’m sorry I shouted. Let’s start over. For my first post (which was a whole month ago! How the time flies) I asked a simple question: Which games would benefit from a Zelda Weapon? What was most intriguing was that many of the responses from readers reached a consensus: every game could be improved by the addition of Link’s Hookshot. If you had to pick one melee weapon to give to all Player Characters, what would it be? This isn’t a search to find the favourite close-combat weapon. This isn’t necessarily a hunt for the most powerful tool for hitting-people. The intention is to see if we can decide on the ‘best’ weapon; the most ideal melee weapon for any game. What follows are some suggestions for the Ideal Melee Weapon, starting with my own personal candidate. I look forward to reading your suggestions. This melee weapon is one of the reasons I loved the Legacy of Kain series growing up. 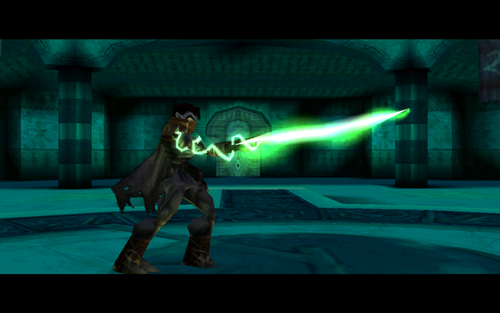 Basically this coil of energy is the ‘innards’ of a powerful sword known as the Soul Reaver, which was smashed open. An over-simplified summary, I know, but I want to talk about what this thing can do. First off, this weapon is lethal. Humans, vampires, monsters and demons all succumb to this ethereal cutter. It’s also easy to use. Point your arm wherever you want the pointy end to go. Just swing away. It never breaks, never blunts and beats all defences. This weapon can cut a person apart or it can punch the soul right out of someone. This weapon literally eats souls. The blade can also be imbued with elemental powers like fire, so you can use flame attacks. Oh, and the Blade can also fire pulses of energy, so it doubles as a ranged weapon. You don’t even need to carry this weapon; it’s bound to your arm and it’s as light as a feather. Okay, so it doesn’t actually come off, but you can make it disappear if you don’t need it. Plus, you can summon it with a flick of your arm, which is cooool. You get that same moment when you turn on Halo’s Energy Sword (‘buzz-swish’), but the Wraith Blade never runs out. Frankly, I struggle to see any weaknesses with this beast of a blade. None whatsoever. Well, there is one. A tiny flaw. Barely worth mentioning. You see, the Wraith Blade is ever so slightly sentient. It’s partly why it needs to feed on souls, and well… sometimes the Wraith Blade can get a bit…overexcited. When that happens, it has a tendency to start (cough) consuming-the-soul-of-the-person-carrying-it (cough cough). Like I said hardly worth mentioning! So long as you keep feeding your enemies to the sword, it’ll be your best friend! As said earlier, this isn’t a discussion about the best weapon in terms of how cool or iconic the weapon is. If it was, Bioshock’s Wrench or Half Life’s Crowbar would be here. However, these DIY tools don’t stack up against the powerful weapons available in other games. The Sledgehammer in Red Faction just might though. It’s not just the fact that a swing of this thing can take out the wall of a building. That is important of course. But it’s also about the ragdoll element. You hit a baddy with the sledgehammer and they fold, twist and fly like a punctured balloon. This thing packs one hilarious punch. Oh, and did I mention you can knock through walls with it too? I did? Good. Of course, if the game you’re transferring the Sledgehammer into doesn’t have terrain physics, you essentially have an over-powered stick that humiliates your opponents. For some, that might be enough. I’ve been harsh to Kratos in previous posts, but that doesn’t mean he’s not a superb character, and his twin blades are awesome. They’ve gone by slightly different names during the series (“of Chaos”, “of Athena”) but they’ve never lost their visceral, flashy appeal. The chain-and-blade combo makes these weapons very versatile. Your opponents can be dragged out of the air or pulled close for a brutal pummelling. Between fights, Kratos can use the blades to swing across crevices and scale mountains. Or mountain-sized monsters. 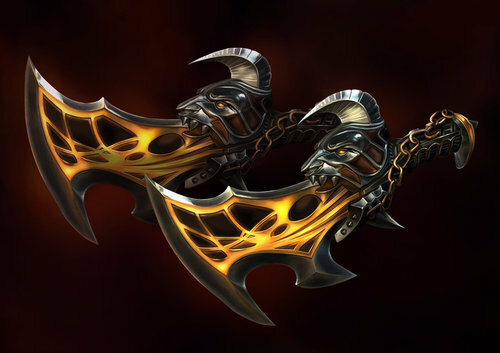 The Blades of Exile are powerful weapons, but it is possible to see weaknesses when Kratos is removed from the picture. The chains add range, but the blades themselves are short by comparison to most melee weapons. Without Kratos’ rage, skill as a warrior and physical strength, I also have to question just how effective these weapons could be. Those spiralling, twirling, combos are not for everyone. L4D2 has katanas, guitars and chainsaws to employ as anti-Zombie devices. So why talk about the frying pan? Well, the chainsaw runs out, the katana is harder to come by and I believe the Frying Pan sounds trumps the guitar. You may disagree, but in my mind the ‘BONK’ of the pan against Zombie skulls beats the ‘TWANG’ of the guitar. Utterly delightful. Plus, if more than one of your party picks up a saucepan, you can charge through the horde producing a wondrous sound. I’ve also heard that the Pan kills Tanks faster than most firearms in the game, but there is no way I’m testing that out. The Pan is no match for the other melee weapons on this list when it comes to power. 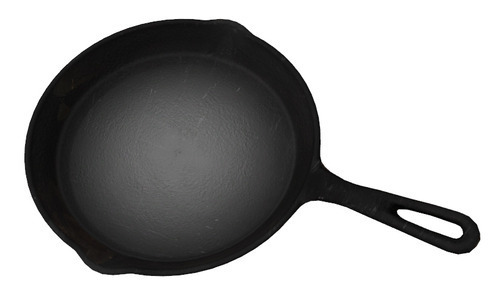 However, this Pan won’t let you down – it’s simple to use, makes short work of its targets, and makes me giggle every time. Some weapons are powerful tools for destruction. Some help you in more elaborate ways. The Dagger of Time allows you to pretend that any mistakes you made never actually happened. Get your head kicked in by a bunch of baddies: REWIND. Want to take someone out more stylishly: REWIND. Fall of a platform: REWIND. Fall of the platform again: REWIND. Fall again: REWIND. And so on. The Dagger of Time also stops or slows time during combat. Even the most unskilled combatant can take advantage of the situation this allows. You can get in a few cheap shots; knock your opponents over; tie their shoes together and run off. If you want to get serious, the blade can punch through armour with ease. The issue with the Dagger is not just its length [add joke about size mattering here]. This is effectively a melee weapon that needs ammo. If you run out of magic sand, and don’t know how to make more, you’re left with a fancy letter opener. I’d be in Link’s bad books if I didn’t mention his sword. After all, his games gave me the idea for this post. It is of course, another example of a very iconic melee weapon. It’s a powerful weapon too – always hits twice as hard as any weapon Link has before it, and if your character is at full health, the blade becomes a beam launcher. 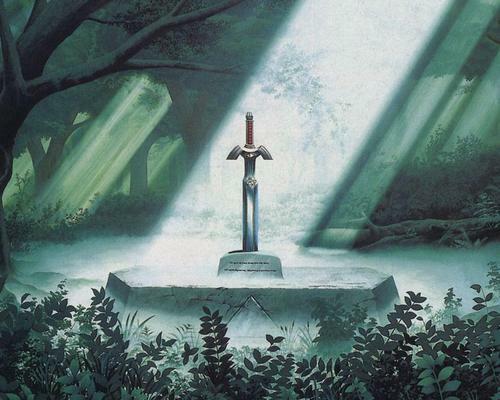 Nevertheless, the Master Sword is another example of a weapon that would not be as effective if transferred to another game. Without Link, there is no ‘spin attack’. Part of the reason that Link uses so many different tools is that his sword isn’t able to deal damage to lots of enemies. What is the best melee weapon in your view? Is there a sharp or blunt instrument that every protagonist should make their first choice? What weapon would transfer well into another game? If this goes well, I’d also like to build on this question in the future. We could find the best ranged weapon, power armour, magic attack… this could lead to the discovery an ‘Ideal Player Kit’; a list of weapons and tools that would turn any basic protagonist into the greatest hero ever.